Citation: Elmalih EBI, Almugadam BS, Tamomh AG, Hassan SM (2018) Influence of Environmental factors on breeding habitats of mosquito species in Kosti City, White Nile State, Sudan. 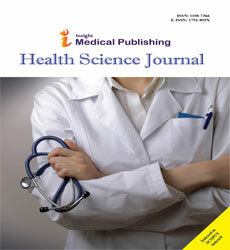 Health Sci J Vol.12.No.4:577. Copyright: © 2018 Elmalih EBI, et al. This is an open-access article distributed under the terms of the creative commons attribution license, which permits unrestricted use, distribution and reproduction in any medium, provided the original author and source are credited. Water temperature is an important determinant of the growth and development rate of immature mosquitoes [1-3]. Mosquitoes are ectotherms, each life stage is dependent on temperature in the developmental and mortality rates . The ability to withstand high temperatures differs among species and even among larval instars . The immature stages of most species are extremely sensitive to temperatures above 40°C during development . Water temperature is positively correlated to larval density . Higher temperatures allow Aedes spp. to grow faster and reach the adult stage earlier . Turbid water is preferred by mosquitoes over clear water . However, et al. found that the sites with relatively clear water produced more An. Arabiens is pupae and larger adults than habitats with turbid water. Larvae of An. Gambiae are found in both clear and turbid water . A. gambiae are seen to breed more prolifically in temporary and turbid water bodies, such as ones formed by rain while, in contrast, A. funestus prefers more permanent water bodies . However, a study for Teklu et al. reported that the A. gambiae to exist in greater quantity in slightly turbid aquatic habitat than in turbid aquatic habitat. For instance, pH of 7.4 was found to be suitable for Aedes spp. [10,11]. Similarly, the work  established that water of a near neutral pH 6.8 to 7.2 was found most optimal for the weakening of the egg shells for the first instar larvae to emerge  and Adebote et al. suggested that pH <5.0 and slightly higher than 7.4 produced a lethal effect on mosquito species. Mosquito species were borne-diseases that cause serious public health problems in most states in Sudan. This situation causes high mortalities among the population of the aforementioned states. However, there are lack of an efficient surveillance system and published reliable data on ecology and bionomics of mosquito species. Therefore, this study is proposed to contribute to better understanding of ecology of mosquito species in areas at risk of diseases and to help health authorities to design proper vector control strategies that will reduce disease burden. The Objectives of this study to determine the effect of water temperature and turbidity on the breeding habitats of mosquitoes species in White Nile state, Sudan. A two seasons study was conducted in selected houses and larval habitats in Kosti town, White Nile State, Sudan. Kosti town is located in Central Sudan. It lies between longitudes (13° 12' -13° 40'E) and between latitudes (13° 39'– 13° 45' N), and at altitude 382 m above sea level. It has a long rainy season which lasts for five months (June-October). The mean annual rainfall is 600 mm; the monthly mean temperature is 22.5°C in winter and 34.5°C in summer and the mean annual relative humidity is 55% . Larvae were collected from 5 breeding sites according to water habitats (water of broken pipes), clay pots, manholes near the bathroom, ponds and streams of water from the study area. Collection was carried out in the morning hours from (7 am to 10 am) for three times a month (at the first week in each month) in autumn and winter in 2015, from three residential areas in Kosti town (Elnasr, Elshatee and Elrabaa). From each residential area, larvae were collected by the dipping method which was described by World Health Organization . The dipper was lowered gently at an angle of about 45° to minimize disruption and either skim the top of the water or gentle lower it to cause the water and nearby larvae to flow into the dipper. Care was taken not to disturb the larvae to prevent them to swim downwards. The surface of the water was skimmed with the dipper, then, the dipper was left out of the water and poured in a white tray containing some water. Size of the dipper, number of dipping and method of scooping were kept uniform throughout the study period. Five replicates of dipping were carried out at each site. Larvae and pupae in each dip were counted and recorded according to their instars and placed in containers with water volume of about 800 mL. The containers were covered by gauze and kept at a temperature of between 28 to 30°C (Figure 1). 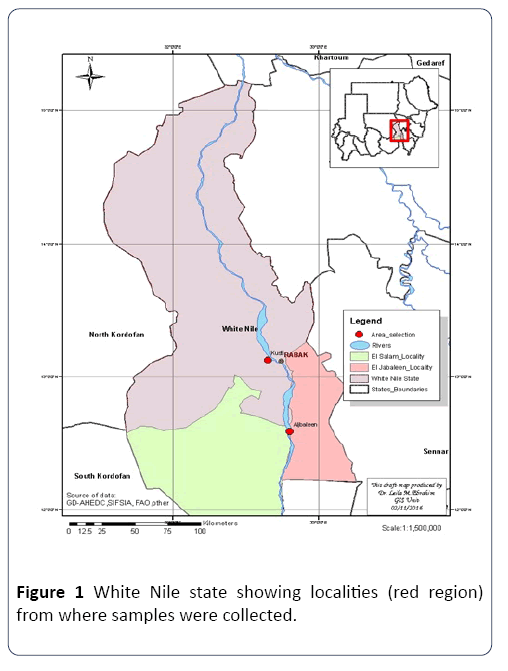 Figure 1: White Nile state showing localities (red region) from where samples were collected. Each sample was labeled to indicate date of collection, site and description of the habitat, locality and environmental determinants. A mercury thermometer was used to measure the water surface temperature while Paline Test was used to measure the turbidity of water. It is often necessary to breed mosquitoes to the adult stage for the purpose of identification. Larvae were kept in water, to assist successful development to the adult stage . Very small amount of rice was added to the water with larvae in trays for feeding. Water in trays was daily changed by clean water and rice. The pupae were sorted out by pipette and put in paper-cups with netting; each cup containing 50 pupae were placed into cages (75 × 75 × 75 cm) with fine meshes and with cotton impregnated with sugar solution inside the cages for adult feeding. After the emergence of the adult the mosquito, they were collected by an aspirator, put into nylon bags and exposed briefly to direct sunlight at ground level or put in a deep freezer to deactivate them. They were later kept in clean dry test tubes and covered by cotton wool until identified. Adult mosquitoes were identified under a dissecting microscope according to Edward , Russel et al. , Reuben et al. 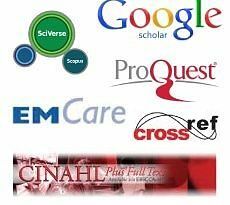 , Harbach , Rueda  and Andreadis et al. and using the Anopheles mosquito keys of the Sudan Gillies et al. and Gillies and Coetzee  methods. The identified adults were recorded according to the genera and species. Correlation analysis was carried out to determine the relationship between distribution and abundance of mosquitoes (immature and adults) among the different habitats, in different residential areas in autumn and winter seasons. Correlation analysis was also carried out to determine the relationship between distribution and abundance of mosquitoes among the different physical and chemical characteristics of water breeding sites . Water temperature had significant effect on the number of immature stages. At the water temperature of (28-31°C) the mean number of immature stages of mosquito was found with the mean (40.13±2.50) that was significantly higher than (27.00 ± 5.67) at (24-27°C) (Table 1). The first instar larvae, was recorded with the highest mean (14.64 ± 1.57) was at water temperature (28-31°C), and the lowest mean (3.13 ± 1.22) at water temperature (24-27°C) (Table 1). Table 1 Mean (± SE) total number of immature stages of mosquitoes collected at different water surface temperature in autumn and winter in Kosti town. The first instar larvae were positively correlated with temperature (r2=0.06462, n=168, P>0.05) while the pupae was negatively correlated with temperature (r2=-0.01481, n=168, P>0.05). The first instar larvae were highly significantly positively correlated with water turbidity (r2=0.26185, n=168, P≤0.001) but the pupae were significantly negatively correlated (r2=-0.00946, n=168, P≤0.001) (Table 2). Table 2 Correlation analysis between water variables and number of immature stages of mosquitoes during autumn and winter in Kosti town. Water turbidity had modest effect on the number of immature stages of mosquitoes. The highest mean number of immature stages of mosquito (40.48 ± 3.64) was observed at water turbidity of 451-550 ppm and the lowest mean number (34.95 ± 5.19) was at water turbidity of 150-250 ppm (Table 3). The first instar larvae were found with the highest mean (14.48 ± 2.03) at water turbidity of (451-550 ppm) and the lowest (10.03 ± 1.19) was at (351-450 ppm) (Table 3). Table 3 Mean (±SE) total number of immature stages of mosquitoes collected at different turbidity levels of water in autumn and winter in Kosti town. The highest mean number (12.64 ± 1.33) of Anopheles gambiae was reared at water temperature of 32-35°C and the lowest mean number (6.38 ± 1.41)was reared at water temperature of 24-27°C. the highest mean number (15.25 ± 4.37) of C. univitattus was reared at water temperature of 24-27°C and the lowest mean number (2.84 ± 0.94) at (32-35°C) (Table 4). Table 4 Mean (± SE) total number of adult mosquito species (Ã¢ÂÂand Ã¢ÂÂ) reared from developmental stages collected from breeding site of different surface temperature in autumn and winter in Kosti town. *Values in parenthesis=number of observations. In this study Culex quinquefasciatus, was highly significantly negatively correlated with water temperature (r2=-0.50714, n=168, P≤0.001) while C. pipiens was significantly positively correlated with water temperature (r2=0.25072, n=168, P≤0.001). In this study Culex quinquefasciatus was highly significantly positively correlated with water turbidity (r2=0.29832, n=168, P≤0.001) and C. theileri was significantly negatively correlated (r2=-0.18737, n=168, P≤0.05) (Table 5). Table 5 Correlation analysis between water variables and number of adult mosquito species (Ã¢ÂÂandÃ¢ÂÂ) collected in autumn and winter in Kosti. In this study Anopheles gambiae complex was reared with the highest mean (13.86 ± 1.81) in water turbidity of (451-550 ppm) and the lowest (8.50 ± 1.06) in (351-450 ppm), C. univitattus was reared with the highest mean (14.40 ± 2.36) in (351-450 ppm) and the lowest (5.95 ± 1.97) in (150-151 ppm) (Table 6). Table 6 Mean (± SE) total number of adult mosquito species (Ã¢ÂÂandÃ¢ÂÂ) reared from developmental stages collected from breeding sites of different water turbidity levels in autumn and wintering Kosti town. Water temperature is one of the most important factors that account for development of larvae . It is an important determinant of development rate of immature mosquitoes [2,3]. A study demonstrated that the immature stages of most species are extremely sensitive to temperatures above 40°C during development . The authors of that study reported that average optimum temperature for the development of most mosquito species is around 25-27°C and the development could be arrested at 10°C. In this study, the first instar larvae were more susceptible to water temperature. It is possible that the development of immature stages were suppressed by high and the low water temperature. Low water temperature prolonged the development and high water temperature caused death of the immature stages. This assumption is in line with that reported by Craig et al. who found the thermal death for mosquitoes was around 40-42°C. Slightly higher water temperature results in a faster development. According to Paaijmans , an ability to withstand high temperatures differs among species and even among larval instars. Older larvae seem to be more susceptible to heat than younger ones. In this study, water temperature was significantly negatively correlated with number of first and second instar and it was highly significantly negatively on number of pupae. This explains that the newly emerged larvae were affected by low water temperature, which probably elongate the developmental period for the first and second instar and pupa. The third and fourth instar was significantly positively correlated with water temperature. According to Ibrahim  who found the immature stages of most species are extremely sensitive to temperatures above 40°C during the development. Tolerance to temperature depends on the species . In the present study, the mean water temperature for development was found ranging between 24°-39°C. A. gambiae complex collected was significantly positively correlated with water temperature in Kosti town. This explains that A. gambiae complex prefers development and breeding at high degree of water temperature. A study of Teklu et al. they found that water temperature was positively correlated with mean larval density of the dominant species. The development rate of A. gambiae complex increased up to water temperatures of approximately 37°C, after which it sharply decreased . In this study, An. gambiae complex was also observed with tolerant to relatively low degree of water temperature (24-27°C). Water temperature was positively correlated with mean larval density of the dominant species, A. pharoensis which is tolerant to relatively high water temperatures . However, Lindsay et al. reported that water temperatures in the pools that are preferred by An. gambiae mosquitoes are warmer than air temperatures. Turbid water is preferred to clear water . In the current study, most stages preferred water with high turbidity ranging from (551-650 ppm). This explains that high turbidity of water was important for development of other instars and the high water turbidity possibly suppressed development of fourth instar larvae. At the same time, high water turbidity was preferred by the pupal stage. Anopheles gambiae complex were positively correlated with water turbidity. It is possible that factors other than turbidity affected the latter genus. A study of Paaijmans  reported that turbid water is preferred for mosquitoes over clear water. However, another study reported that An. gambiae complex was greater in slightly turbid aquatic habitat than in turbid aquatic habitat Culex spp. preferred turbid water in the same season . Most species were significantly positively correlated with temperature and turbidity of water. Ammar SS, Kenawy MA, Abdel-Rahman HA, Ali AF, Abdel-Hamid YM, et al. (2013) Characterization of the mosquito breeding habitats in two urban localities of Cairo Governorate, Egypt. Greener J Biol Sci 3: 268-275. Paaijmans KP (2008) The impact of meteorological factors on water temperature and larvae of the Afro-tropical malaria vector AnophelesgambiaeGiles. PhD. thesis. Wageningen University, the Netherlands. Paaijmans KP, Jacobs AF, Takken W, Heusinkveld B, Githeko AK, et al. (2008) Observations and model estimates of diurnal water temperature dynamics in mosquito breeding sites in western Kenya. J Hyrological Processes 22: 4789-4801. Lindsay M, Johnson B, Nelson WA, Paaijmans KP, Read AF, et al. (2013) The Effect of temperature on anopheles mosquito population dynamics and the potential for malaria transmission. United States Department of Agriculture National Research Initiative 8: 35302-17149. Ibrahim MMM (2011) Species composition and characterization of larval habitats of mosquitoes in El-Kareiba and Barakat, Gezira State, Sudan. M. Sc thesis. University of Khartoum. Teklu BM, Tekie H, Cartney M, Kibret S (2010) The effect of physical water quality and water level changes on the occurrence and density of Anopheles mosquito larvae around the shoreline of the Koka reservoir, central Ethiopia. Hydrol Earth System Sci 14: 2595-2603. Neto PL, Silva MAN (2004) Systematics, morphology and physiology, development, longevity, gonotrophic cycle and oviposition of AedesalbopictusSkuse (Diptera: Culicidae) under cyclic temperatures. Neotropical Entomol 33: 029-033. Paaijmans KP, Takken W, Githeko AK, Jacobs AF (2008) The effect of water turbidity on the near-surface water temperature of larval habitats of Anopheles gambiae in western Kenya. J Biometrol 52: 747-753. Craig MH, Snow RW, Sueur D (1999) A Climate-based distribution model of malaria transmission in sub-Saharan Africa. Parasitol Today 15: 105-111. Adebote DA, Oniye SJ, Ndams IS, Nache KM (2006) The breeding of mosquitoes (Diptera: Culicidae) in peridomestic containers and implication in yellow fever transmission in villages around Zaria. Northern Nigeria. J Entomol 3: 180-188. Afolabi OJ, Ndams IS, Mbah CE, Kogi E (2010) The effects of alteration of pH on the breeding characteristics of mosquitoes in phytotelmata in Ahmadu Bello. Int J Biosci 5: 32-36. Okogun GRA, Anosike JC, Nwoke BEB (2005) Ecology of mosquitoes of Midwestern Nigeria. J Vector Borne Dis 42: 1-8. Service MW (1977) Mortalities of the immature stages of species B of the Anopheles gambiae complex in Kenya: comparison between rice fields and temporary pools, identification of predators, and effects of insecticidal spraying. J Medical Entomol 13: 535-545. Elhassan ZM (2009) Species composition and larval habitats, of mosquitoes (Diptera:Culicidae) in urban and semi urban of White Nile State. Sudan. M.Sc Aljazeera University. World Health Organization (2012) Handbook for Integrated Vector Management. World Health Organization. pp: 68-72. Becker N, Zgomba M, Madon M, Kaiser A, PetriÃÂ D, et al. (2010) Mosquitoes and their control. (2nd edn.). Heidelberg Dordrecht London New York. Springer. pp: 608-615. Edwards FW (1941) Mosquitoes of the Ethiopian region. Culicinae adults and pupae. London, Order of the Trustees. British Museum (Natural History). pp: 515-520. Russel PF, Rozeboom LE, Stone A (1943) Keys to the Anopheline mosquitoes of the world with notes on their identification, distribution, biology, and relation to malaria. The Academy of Natural Sciences Philadelphia. Am Entomol Soc, pp: 154-160. Reuben R, Tewari SC, Hiriyan J, Akiyama J (1994) Illustrated keys to species of Culex (Culex) associated with Japanese Encephalitis in Southeast Asia (Diptera: Culicidae). Mosquito Systematics. American Mosquito Control Association. 26: 75-96. Harbach RE (1985) Pictorial keys to the genera of mosquitoes, subgenera of Culex and the species of Culex (Culex) occurring in southwestern Asia and Egypt, with a note on the sub generic placement of Culexdeserticola (Diptera: Culicidae). Army Institute of Research. Mosquito Systematics. National Museum of Natural History. 17: 83-107. Rueda LM (2004) Pictoral Keys for the Identification of Mosquitoes (Diptera: Culicidae) Associated with Dengue Virus Transmissions. Magnolia Press Auckland. News Land. pp: 60-70. Andreadis TG, Thomas MC, Shepard JJ (2005) Identification guide to the mosquitoes of connecticut. The connecticut agricultural experiment station. New Haven. Gale Ridge. pp: 173-179. Gillies MT, de Meillon B (1968) The Anophelinae of Africa South of the Sahara (Ethiopian Zoogeographical Region). Second edition. South African Institute for Medical Research. Johannesburg. pp: 54-60. Gillies MT, Coetzee M (1987) A supplement to the Anophelinae of Africa South of the Sahara (Afrotropical region). Johannesburg. The South African Institute for Medical Research. Johannesburg. pp: 146-150. Day RW, Quinn GP (1989) Comparisons of treatment after an analysis of variance in ecology. Ecological Monographs 59: 433-463. Himeidan YE (2000) Studies on the biology and behavior of the mosquito Anophelesarabiensis Patton (Diptera: Culicidae) in Eastern Sudan (New Halfa town). M.Sc. Thesis. University of Khartoum. Sudan. Bayoh MN, Lindsay SW (2004) Temperature-related durations of aquatic stages of the Afrotropical malaria vector mosquito Anopheles gambiae in the laboratory. J Med Veterinary Entomol 18: 174-179. World Health Organization (1997) Vector control methods for use by individuals and communities. World Health Organization. Geneva. pp: 113-117.